Figure 1: Regional north-south seismic line through the Hammerfest Basin with (inset) outline of the basin showing major fields. The Hammerfest Basin is an east-west trending graben located in the Norwegian Barents Sea. Sediments of Carboniferous to Cenozoic age cover the Caledonian basement, the thickness of which varies, but can exceed 10 km. Exploration began in the 1970s and the first exploration well was drilled in the basin in 1980. Since then a number of oil and gas discoveries have been made in this prolific basin. The classic Middle Jurassic play is well explored; however, the pre-Jurassic/uppermost-Triassic succession has only been penetrated by a few wells. To be able to detect and delineate the remaining unexplored potential of various stratigraphic levels in the Hammerfest Basin, new 3D seismic data was needed. 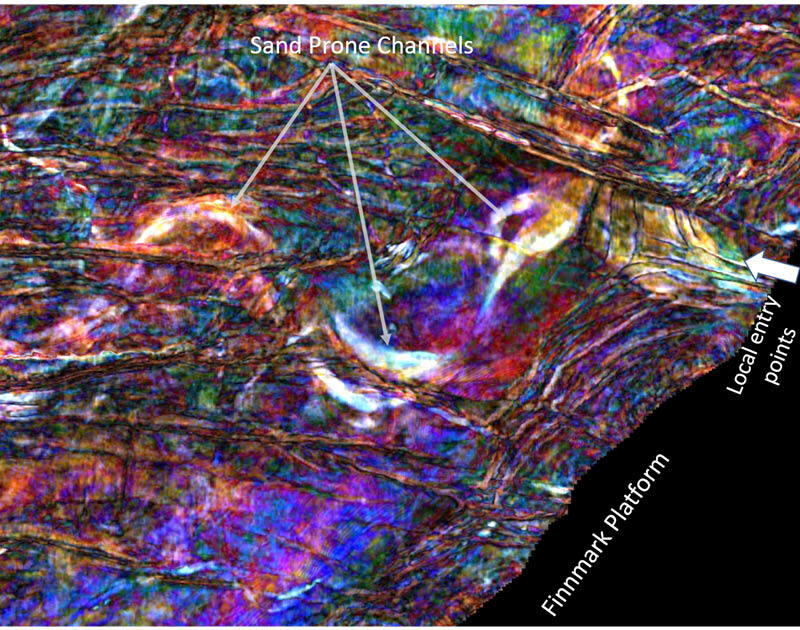 Therefore, between 2015 and 2016, about 4,500 km2 of 3D seismic data was acquired by Searcher Seismic, demonstrating the clearest image yet of several depositional packages in the basin. This data with high quality broadband processing sequences supports the exploration of the deeper plays in the basin. 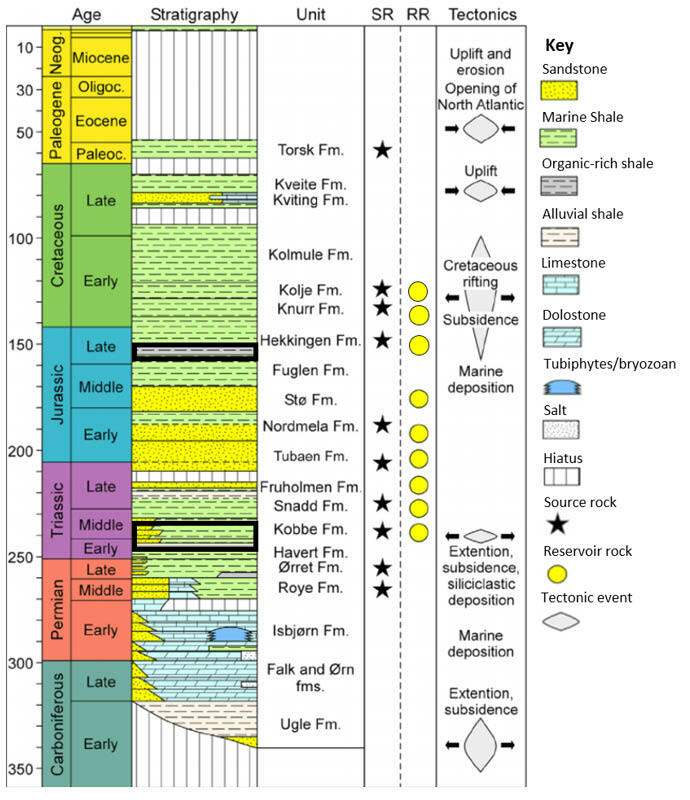 Chronostratigraphic column of the Hammerfest Basin. Modified from Dor e (1995), Ohm et al. (2008) and Duran et al. (2013a) A total of 44 wells have been drilled in the Hammerfest Basin, resulting in 18 oil and gas accumulations with an exploration success rate of over 50% for the basin. The Snøhvit field produces gas and condensate from Middle/Lower Jurassic reservoirs, while the Goliat field produces oil from Middle/Lower Jurassic and Middle Triassic reservoirs. Along the flank of the basin minor discoveries were made in the upper Jurassic (Hekkingen Formation) and in the lower Cretaceous Knurr and Kolje Formations (see Figure 1). Hydrocarbon show analysis indicates that considerable volumes of hydrocarbons have migrated into the basin. However, later isostatic uplift resulting in remigration and leakage of hydrocarbons complicates the picture. Searcher’s 3D seismic, broadband processing and advanced multi-volumes blending techniques improve the possibility of detecting and delineating the remaining prospectivity within the basin. Significant remaining hydrocarbon potential exists in the prolific Hammerfest Basin. While most is currently expected to be found in the Mesozoic interval, potential may also exist in the Palaeozoic. In general, reservoir parameters of these deeper plays are slightly lower due to greater burial depths, predating the major Cenozoic uplift. Here, we go into more details for each of the above intervals/plays. Figure 3: Upper Triassic Snadd Channel complex. There are minor discoveries (Skalle and Myrsildre) in the Lower Cretaceous-Upper Jurassic intervals. 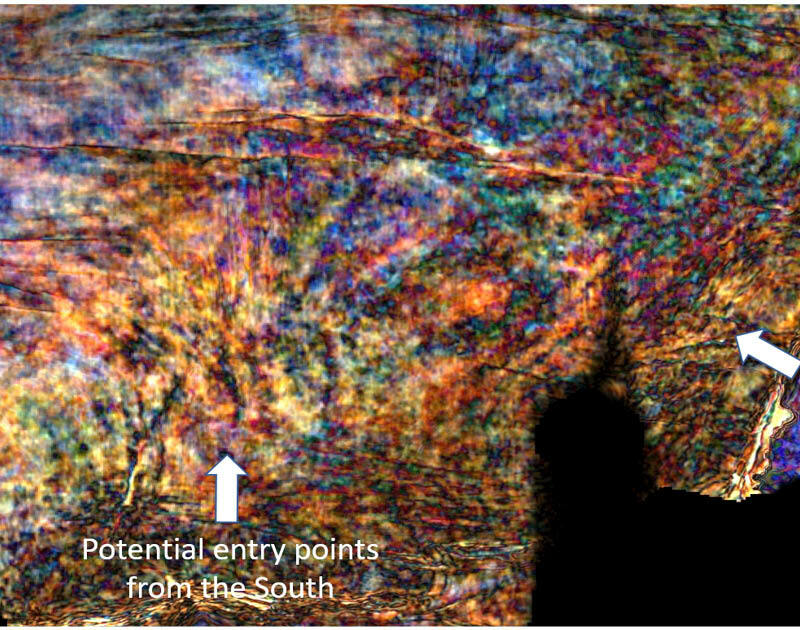 The 3D seismic indicates the presence of remaining potential along the flank of the basin. Turbidite fan systems can be identified on the seismic using AVA attributes (Figure 2). Analysis of the qualitative Extended Elastic Impedance attribute shows the presence of a strong AVA anomaly above and below the Base Cretaceous horizon (lower green) in the southern flank of the basin. 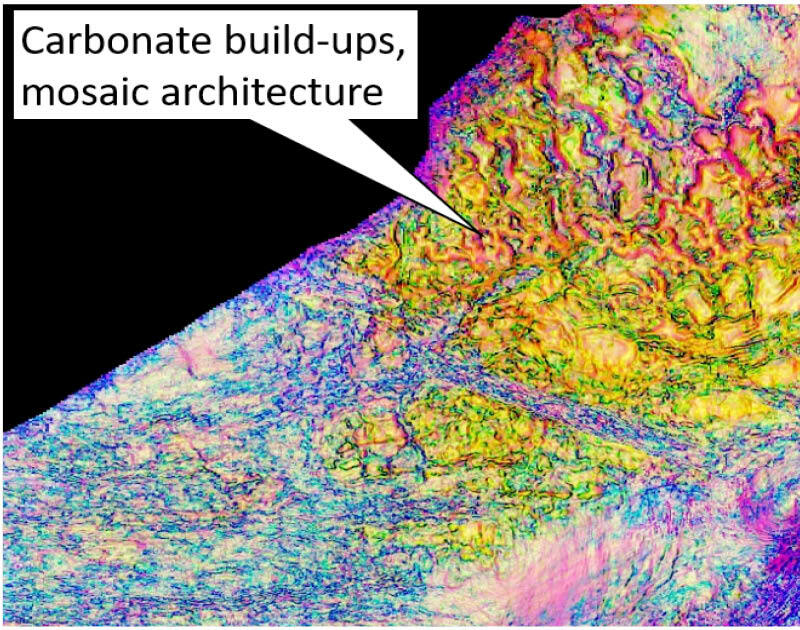 This anomaly could be due to variation of lithology, porosity, thickness or hydrocarbons in the fan systems, providing supporting evidence that underexplored stratigraphic traps can work in the area. The strong AVA anomaly below the base Cretaceous marker here is an unpenetrated upper Jurassic sand (Hekkingen Formation), which may indicate additional potential in the area. There is still undrilled potential in the classic Middle Jurassic-Uppermost Triassic fluvial to shallow marine reservoirs defined by structural traps. Several small to medium-sized horsts and rotated fault blocks define the traps in this area. The Bajocian Stø Formation is expected to represent continuous reservoirs, deposited in a lower to upper shoreface environment, whereas the uppermost Triassic typically consists of channelised complexes. Figure 4: Mid Triassic Kobbe fan system. 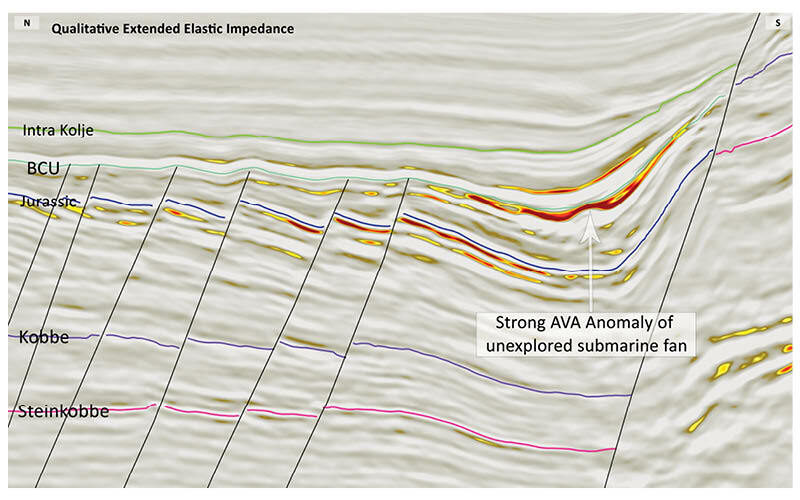 3D seismic clearly defines the outline of the Snadd Formation channel systems (Figure 3). There is clear evidence of sand deposition in the channels based on seismic character. The change in amplitude can be attributed to change of facies, porosity, interval thickness or hydrocarbon presence within the channel system. It is a challenge to separate the lithological effect from hydrocarbons within the channels at this depth. New multi-attribute blending techniques can help delineate the outline, geometry and possible content of the channels. Figure 5: Permian / Carboniferous carbonate. 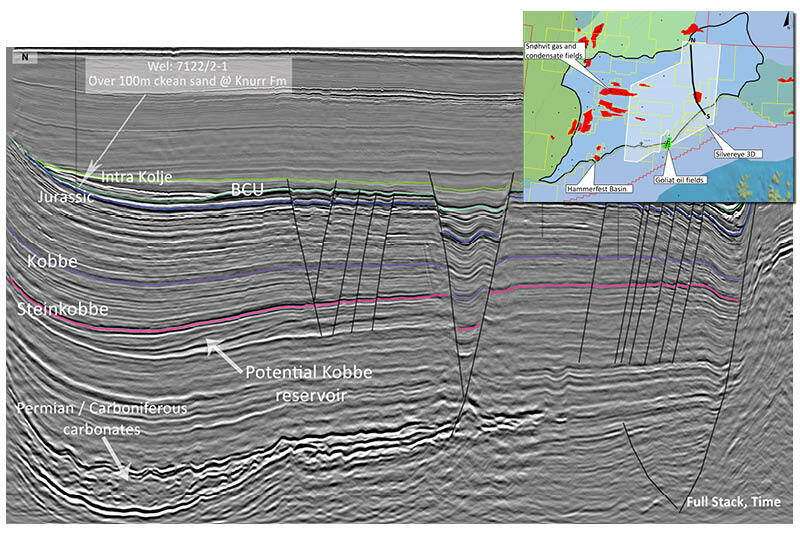 The discovery of the Goliat oil field in the early Triassic Kobbe Formation interval proves both the Kobbe play and the Triassic petroleum system and supports this attractive additional play in the basin. Goliat produces from both the Kobbe and from reservoirs in the Upper Triassic/Jurassic Realgrunnen Group. Interestingly, minor oil was also proven in the Triassic Klappmys and Snadd Formations. The outline of the Kobbe reservoir and the source rock potential is uncertain but may have significant potential in other parts of the basin. New wells are expected following the recent APA awarded licences, which will further clarify the remaining potential. Figure 4 suggests that there is possibly local deposition of sand in the Kobbe Formation derived from the Fennoscandian shield to the south, indicating a good reservoir characteristic for the Kobbe in this area. Although deeply buried, the Upper Permian sandstones penetrated by well 7120-12/2 show that reservoir porosity may also exist at this level. Permian and Carboniferous age carbonates are very well developed in the north-eastern part of the basin (Figure 5), and most likely consist of Paleoaplysina, Phylloid algea and Bryozoan type build-ups that grew in a distinct polygonal way and are interbedded with evaporites. The carbonate play, which has similarities with the Alta Gotha discoveries, is undrilled in this area. In the Hammerfest Basin substantial volumes of hydrocarbons, both oil and gas, have been discovered in the classic Jurassic and Middle Triassic formations. Two fields, Snøhvit and Goliat, are in production and new discoveries expected, either standalone, or tied back to existing facilities. However, broadband processed 3D seismic acquired by Searcher Seismic shows significant underexplored potential in the basin, revealing remaining hydrocarbon potential in undrilled Jurassic structures and significant yet-to-find volumes in the Middle Triassic and Upper Jurassic to Lower Cretaceous plays. Little is known of the Early-Mid Triassic Kobbe Formation, which represents an important part of the Goliat Field and may be a very attractive future target. Palaeozoic plays are as yet undrilled in most of the area. In addition, the seismic data may unravel well developed carbonate build-ups towards the north-east of the basin. The Canadian portion of the Beaufort Sea has been the site of intense interest and bidding in recent licensing rounds. Regional reconnaissance 2D seismic programs designed to image down to the base of the Earth's crust are redefining frontier basin evaluation.